What is Difference Between Quilt and a Blanket? A Quilt or a Blanket? So, you want to have a T-Shirt Quilt made from your shirts. How do you select from what seems like hundreds of tee-shirt or T-Shirt Quilt makers? 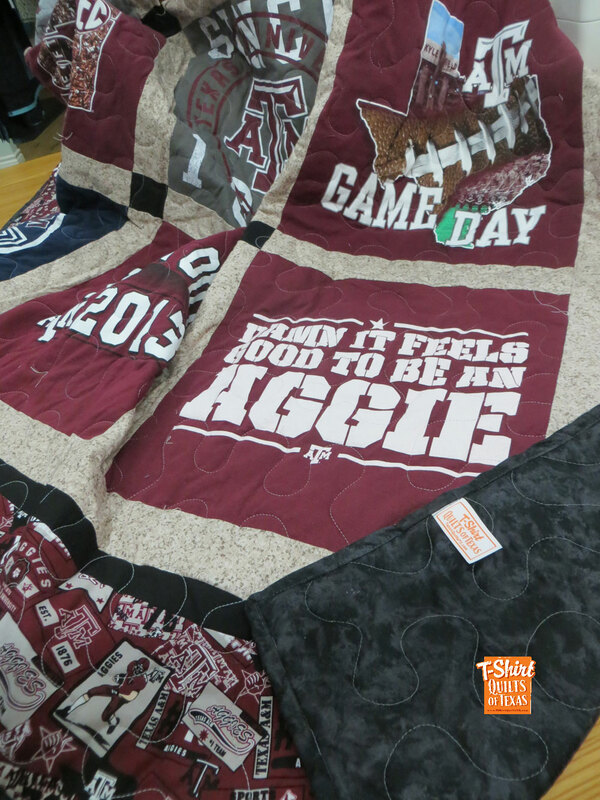 Rather than looking for a 'local' t-shirt quilt maker - lets figure out whether you are getting a quilt or a blanket. kwilt/noun:quilt; a warm bed covering made of padding enclosed between layers of fabric and kept in place by lines of stitching, typically applied in a decorative design. blan·ket blaNGket/ cover completely with a thick layer of something. That is interesting - 'A layer of something' - that is what you need to be on the lookout for. Read the details on any website and if they bother to tell you what they put on the back, you'll see things like "a brand new sheet" or "fleece". Fleeceis usually a keyword meaning - no batting. To cut costs, some non-professionals with use fleece ($3 bucks a yard at Joann's) instead of a layer of batting and layer of cotton backing fabric. Keep in mind that the top of your quilt is mostly cotton, and fleece is usually a polyester. More than likely the crafters will 'tie' your beloved t-shirts; not quilt them. The first time you try to launder your blanket you will end up with jumbled mess of fabric. The 'new sheet' should really raise a red flag. Remember those cheap sheets you had when you were first on your own that made those little nubbies? At least ask them what the thread count is for the sheets. You can have a quilt with a sheet for the backing, it is just not recommended. Keep in mind that professional quilters will have a wholesale account with one or more fabric distributors, and shouldn't be depending on a 40% off coupon from Joann's. They should provide quilt shop quality fabrics, batting and other supplies needed to complete your custom t-shirt quilt. At T-Shirt Quilts of Texas, we have over 700 bolts of fabrics to select the best color combinations for your special quilt. We only use the highest quality materials when making your quilt, and refuse to compromise on quality to save a few dollars.